I've lots of Christmas photos to post. Please stand by while I get them ready. 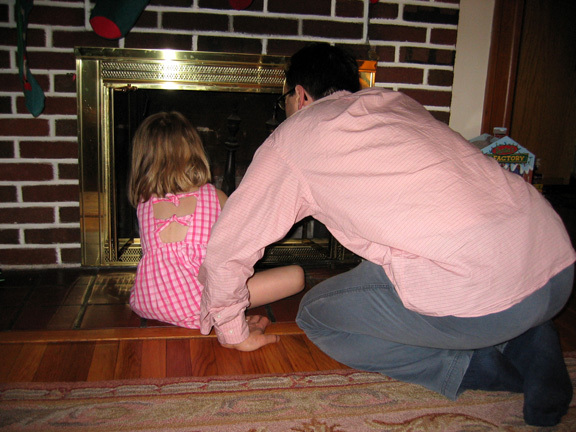 My niece Emma and her dad Dan made sure the fireplace was ready for Santa on Christmas Eve. Photos are now posted in the Christmas 2003 photo album. Let's see some Emma and Zoey pics! Haircuts and all! Check out the Christmas 2003 photo album. The haircuts weren't that bad. If you are just tuning in, my niece Emma gave herself, and her younger sister Zoe, unauthorized haircuts last week. the christmas seafood feast looks delish!!!!! all the little kiddies are sooo cute! Nieces are the best! Guess who was a pig and ate about half of Richard and Jytta's hand-dug oysters? Really? Get thee to the Oyster Bar! Jytta mixed the oysters with chopped mushrooms and cream and broiled them on the shell. They were great with shots of dill schnapps.